Tuscany region, in Italy, is famous for the great number of spas located on its territory and among these there is surely the Sant’Elena spa. The Sant’Elena Spring is situated on a charmingly high hill in the area of Chianciano Terme. A park of age-old oaks, majestic pines, silvery olive trees and radiant broom surround it, creating an ecological oasis of tranquillity. Its panorama includes the three lakes of Chiusi, Montepulciano and Trasdimeno as well as Monte Amiata. Sant’Elena water is bicarbonate, low in minerals, high in calcium and alkaline and has important therapeutic properties, clinically-proved and scientifically-tested. Sant’Elena’s water increases diuresis, acts as a detofixier, promoting the elimination of renal calculus and gravel, combating acute and chronic inflammation of the urinary tracts, regulates the effect of uric acid on the metabolism, facilitates digestive functions and is indicated for gastroenteric dyspepsia. Its properties, famous for centuries, have contributed to the creation of a spa including an events and conference centre within a park. The park and its large salons with a well-equipped elegant bar offer clients numerous ways to relax in comfort. Every afternoon an orchestra performs to an enjoyable dance floor. Physical harmony is mirrored by the music, the pace of strolls, the enjoyment of games in a perfect setting. The park’s new salon, with 1500 spectator seats, offers an amazing stage for important events, concerts and fashion shows. Numerous bowling greens in the midst of nature are at disposal of sport lovers, while television and reading rooms are ideal for relaxing moments. An area for games is dedicated to children and splendid sun terraces are among the various services offered in the park. The conference centre of 3 rooms with capacity for a respective 100, 350 and 400 people is available for meetings, conferences, shows and banquets. Sant’Elena mineral water, whose properties are well-known, is bottled with the “Sant’Elena” and “Marzia” brands in a new and modern building near the spring ans exported everywhere. Sant’Elena is the ideal place for well-being treatments of both mind and body. Its geographical position permits visitors to move around Tuscany, visiting its symmetrical, gentle and harmonious shapes, its unrivalled art and other pleasures. 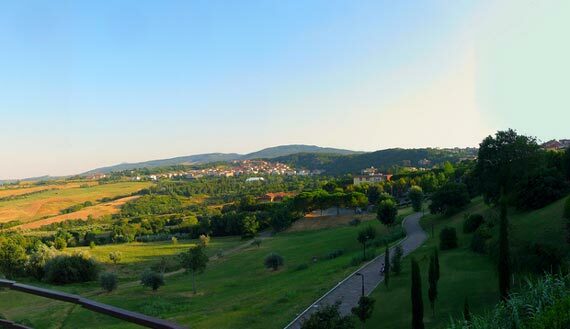 You can admire the numerous typical holidays villas in Tuscany spread over the sweet hills.